The following anecdotes highlight and describe some of the day to day struggles of bringing communist ideas to the working class. Sometimes it seems more realistic to play down the communist solution to the specific attacks on our fellow workers and us. It seems that we’ll get farther if we militantly mobilize without making such a big deal of questioning capitalist assumptions. Then reality sets in. The lead-up to our boeing summer project features just such an example. A number of workers openly argue that the union is placing the emphasis on labor law because the mis-leadership doesn’t really want to fight the bosses on the picket line. We go farther, saying capitalist law is a deadly con and must be replaced by masses mobilized around communist principles. Is Red Flag’s insistence on a communist solution just so much extra baggage making it harder for us to mobilize militantly during the next strike? Quite the contrary: our communist analysis allowed us to escape a trap. The judge demanded the company and union meet to work out a compromise. The union jumped at the chance. Secret meetings are now in progress. Every media outlet from the Seattle TV and newspapers to the New York Times and the Wall Street Journal has floated trial balloons suggesting the shape of that agreement. In exchange for an empty promise of some union jobs on a hypothetical program years in the future the union will sign a no-strike agreement for at least a decade. We already derailed a no-strike regime a couple of years back. This time, the union leaders hope the law will give them the political cover they need to ram this through. Communist mobilization shows us the way out of the capitalist trap—now and in the future. When the comrade told me, “We’re going to meet with the comrades from ICWP,” I had no doubts about carrying out the task with her. We needed to organize the final details and go to the May Day march in San Salvador to take communist ideas to the workers. First we went to the northern part of the country. There was little transportation due to vacations, but this wasn’t an obstacle. Afterwards we walked several kilometers and arrived at our destination. The comrades were waiting for us enthusiastically. We shared the food and talked about how we would march. The youth there said that they wanted to distribute the ICWP literature. Other comrades were assigned the task of security, which they carried out with great responsibility during the activity. 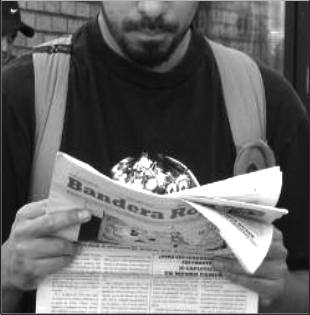 This made the youth feel more secure when they distributed our newspaper Red Flag and the leaflet, because they knew that behind them were the alert and vigilant comrades ready for anything. The buses on which we traveled to the capital were stopped by the police, since there were many checkpoints. We took precautions with the literature since some people were searched. We finally got to the San Salvador. 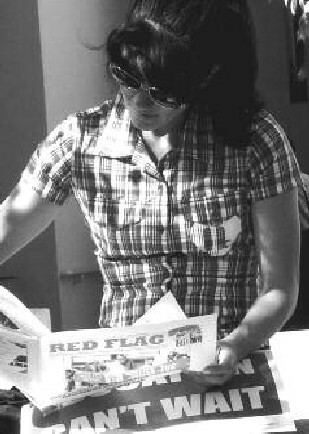 Thousands of workers received our newspaper Red Flag and the leaflet which is always well received by students, rural and city workers, teachers and professionals. At the end of the march we felt satisfied, since we distributed our material without any difficulty. It encourages us that the workers received it with pleasure and even asked for more. When we see that they stop to read it, we understand that our efforts were worth it. 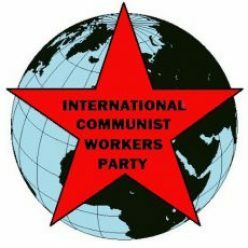 Once more it has been shown that we, the members of ICWP, are the ones who carry out the work of taking communist ideas to the workers. Continuing political struggle and discussion made this meeting possible. I remember when I first asked the workers to contribute economically to ICWP and Red Flag. I thought they would laugh at me or think I was crazy. but they took it seriously. We now collect hundreds of dollars from these workers to support Red Flag. They also help distribute the paper and participate in other activities. After we emphasized the importance of the summer project and what the participants would learn from it, I asked if they were willing to pitch in more so that we could pay for a participant to come from another country. Everyone again said yes. This level of political commitment isn’t automatic or spontaneous. It’s a process of struggle in which a group of workers are moving towards communism, seeing Red Flag and ICWP as their own. Little by little they’re becoming communist leaders. There are contradictions, doubts, wrong ideas, but our ideological struggle for communism continues in theory and practice. When I was organizing in the military, I had lots of political conversations with one particular fellow soldier. 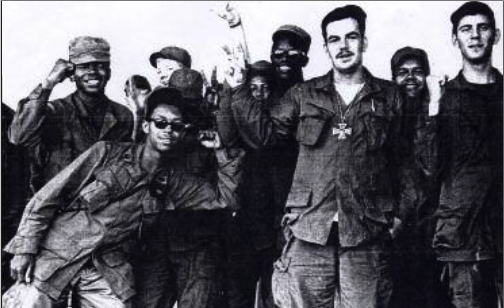 We had a common enemy in our unit: this rotten capitalist system that placed us in a common field bound to be cultivated in friendship and politics. Before I finally gave communist literature to this friend, we had dozens of conversations. We expressed anger at our immediate situation. We both hated our military leadership. We were angry at how U.S. imperialism was carrying out its wars with soldiers who didn’t agree with the war in the first place. Of course, there are always disagreements. We shouldn’t pretend that building a communist revolutionary movement is easy, but struggle over contradictions that surface strengthen relationships. When we came back, my friend attended a May Day dinner and witnessed the enthusiasm of communists fighting for a common goal. 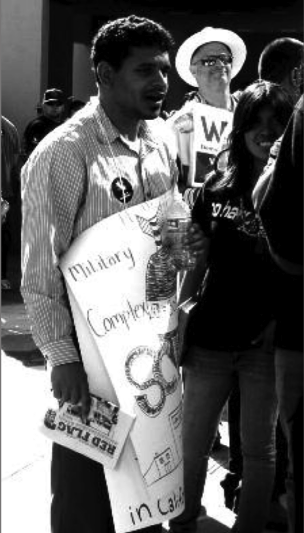 During the following year, he came to meetings and helped inspire other comrades to join the military to organize for ICWP. The next year, my friend was the one on stage at the May day dinner giving an inspiring speech calling for soldiers to turn the guns around. Our ICWP club jumped into a faculty-led struggle against a new law that speeds the privatization of community colleges, making them less affordable. We put forward communism in mass meetings, many conversations, and a leaflet that students received warmly on four campuses. The liberal leaders’ message was that some “social goods” like education should be available for all, not for sale. We attacked the whole capitalist system of private property and exchange, not just the “privatization” of education. “The capitalist rulers are using this crisis … to transform community colleges to meet the needs of their class to prepare for war on the backs of the working class,” our leaflet explained. “Under capitalism, some profit from scarcity and crisis while others suffer and starve. Under communism, we will all share hardship and we’ll all share the abundance our class will create. “Community colleges are not ‘great equalizers’ …. They are illusion factories that teach us to sacrifice to get an education so as to escape from the working class. “Oh, oh, you go on and tell it!” exclaimed one student when she read the leaflet. We are struggling against the idea that students need “liberal arts” (training for mental labor) rather than “vocational education” (training for manual labor). We explained the need for communist education to transform the world starting now, and how education in communist society will be tied to the labor we do for the collective good of the masses. Many are outraged at the capitalist ethic expressed by AB 515 supporters: “when times are tough, those with the most should get more.” They embrace the communist ethic that rejects privilege and fights for the collective good of the masses. The Party’s base has grown around this small campaign. At our pre-May Day dinner a young Iraq vet talked about what he thought would win his twenty-something friends to communism and our party. “When you talk to people on the street, they all say they need money to buy food and a roof over their heads for themselves and their families,” he began. “That’s why I joined the army. I was working three jobs and still couldn’t meet these necessities. “If you want to mobilize for communism, you have to convince people that they can have some ‘security.’” By that he meant that they would get some food, a roof over their heads and the basics of life. “There’s plenty of food at the Safeway around the corner,” offered another comrade. “But it’s under heavy guard. If you’re hungry and go there, take some food off the shelf and try to leave the store without offering any money, you’ll get jumped and then hauled off to jail.” We agreed that if we want to abolish money, we have to distribute food without expecting any money in return. One idea is to keep the supermarkets open, but as distribution centers. All the people whose jobs now currently involve collecting, guarding and transporting money would be freed to do useful things, like delivering food to older people who can’t come in to collect it.